decorate it for the seasons. Simple and pretty, don't you think?? Since it seems we won't be getting any snow anytime soon, I can at least enjoy seeing this little corner in the backyard from the kitchen window and dream of winter. on Instagram you may have already seen it. blogger and I can not get back to you without an e-mail address! I absolutely love your backyard. All of the little things add up to make it look so inviting. The branches from your Christmas tree add a lot. Thanks so much for sharing with us. Your corner on the patio looks good. I always decorate my patio that you can see from my living room as I feel it is an extension of it. Plus it always looks so good when setting in the living and dining room. I guess that we will be getting lots of rain this year, which we need so much. I know here in So CA we really need it. Love everything on your patio and especially using your branches of tree. That looks all rustic and pretty! Love the natural branches with lanterns. I still have branches we cut off our tree on bakers rack and railings of porch in front. Looks like we at least have some winter decos going. I hate how naked things look after holidays. Your yard looks so nice, love winter look and being decorated, keep the holiday mood some. Clever use of your boxes, fence, spool table, etc. Wish we still had our spool table, had to leave it when we left San Diego to move to MT. (in 1992) Our oldest daughters boy friend bought our old truck where spool table was kept. They are so great to have to decorate let alone use on patio. 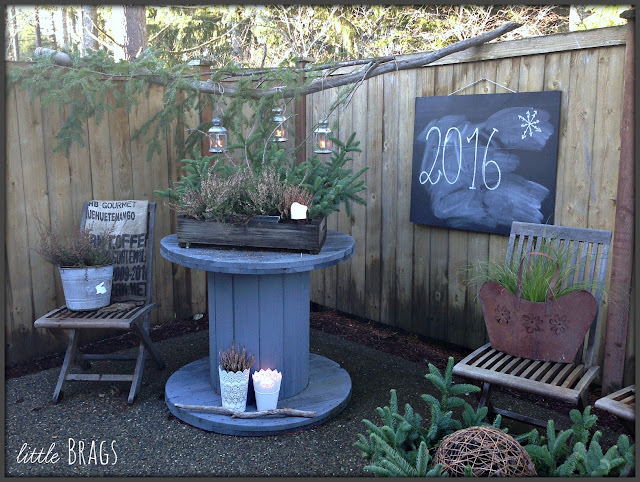 Great idea jazzing up your back yard for little while. We had some snow, some still on ground, but it's melting unless we get more. We didn't put lights out on porch or railings this year as I had right shoulder replaced on Dec. 7th. so hubs was pretty busy taking care of my chores and me, especially about first 3 weeks or so. Can't believe it's been 5 weeks today since surgery. Now trying to get arm to work, having problem being able to raise arm but it'll work itself out, (sure do hope so). Start outpatient physical therapy this week. Have great week and hope your holidays were fantastic. Ohhhh I hope your physical therapy will help you recover quickly, sorry to hear that!!!! Have a happy new year and send us some snow from Montana!!! Christine, Deine Terrasse ist wunderschoen!!! Ich weiss gar nicht, wo ich anfangen soll. I love everything about that decor, to use up your Christmas tree is such a great idea! We planted ours in our garden, cause it came in a pot with roots... but I love evergreens everywhere and all those little cozy touches everywhere, the lanterns and the tubs and crate. Love it! 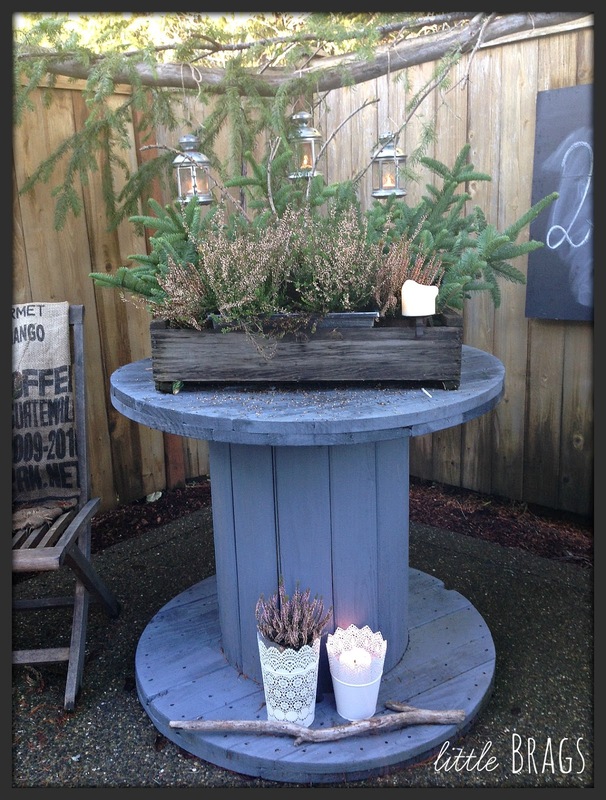 I have to try to find a spool table, I love it! I wanna come and hang out!!! looks great Christine. 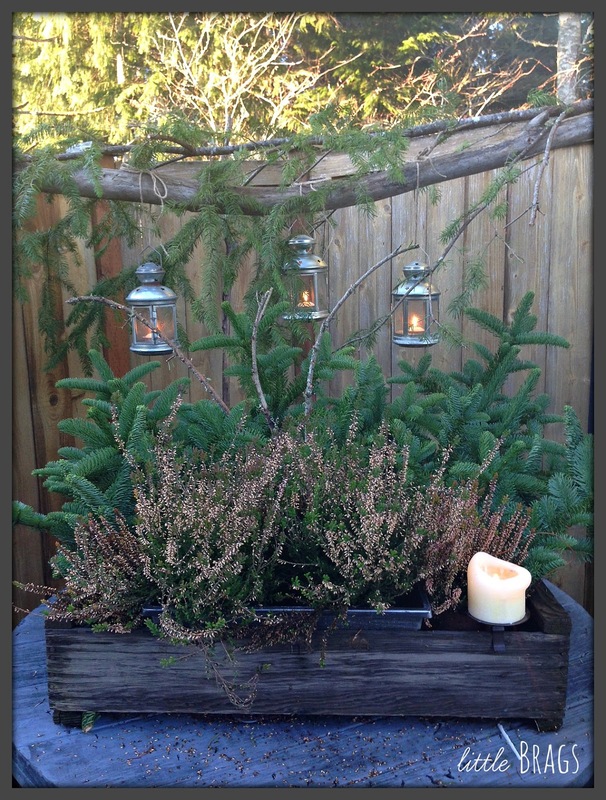 I trimmed some branches off of a few of our pine trees in the yard and am enjoying in pots by the front porch...but alas there is no outdoor decorating here in Ontario as everything is covered with snow...Thanks for sharing and letting me enjoy your yard! 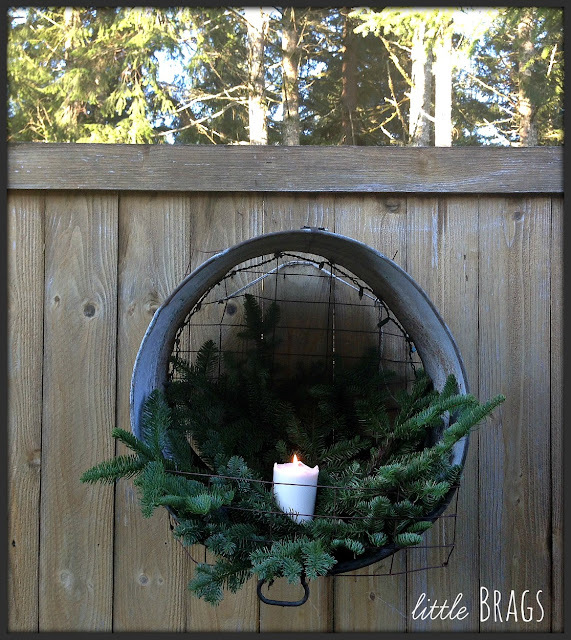 Love that you used branches from your Christmas tree, it adds that rustic coziness to the area. Love it. So many neat details I love all the natural green mixed within everything. The box on the table is great too! The back patio looks so cozy and pretty! 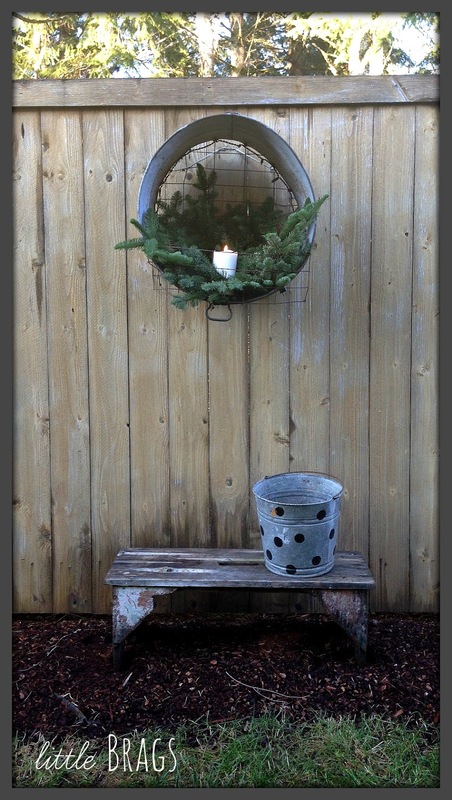 I love how you incorporate rustic elements and metal to give it a homey feel. Happy New year! I love your little corner of the patio. Looks so peaceful and inviting. Would love to hang out there. What a sweet little space with great touches. My winter decor on the porch is snow, ice, more snow. Thanks for linking up to The Talk of the Town party! 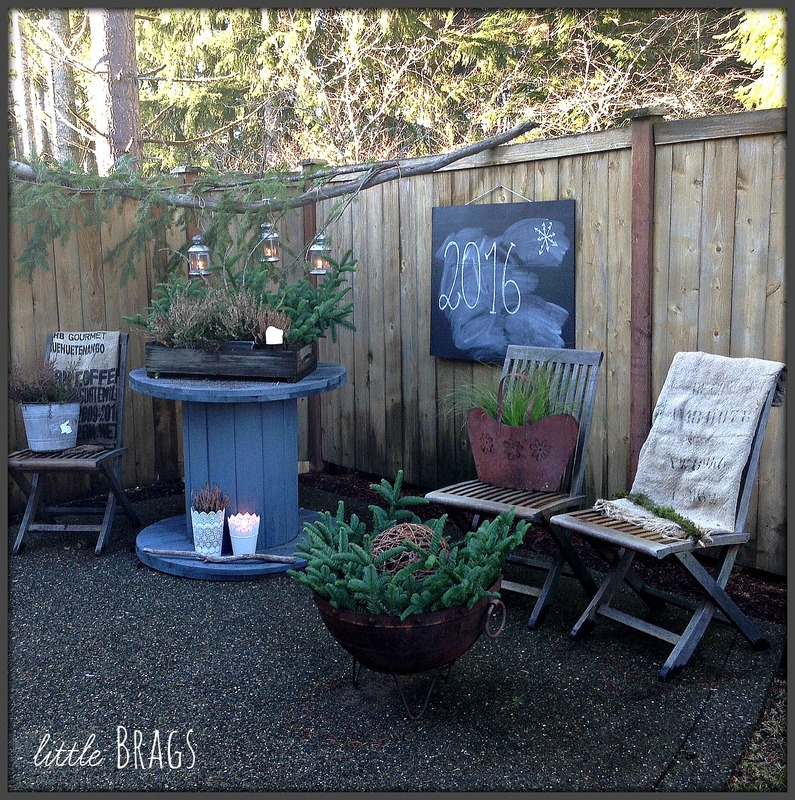 Your outdoor patio area looks so nice! I'm bad about ignoring mine during the winter months. I guess because it's just too darn cold to sit out there and enjoy it. I love the lanterns hanging from the branch! I love the branch with the lanterns hanging from it! Awesome job! I love this outdoor decor and really like your blog. 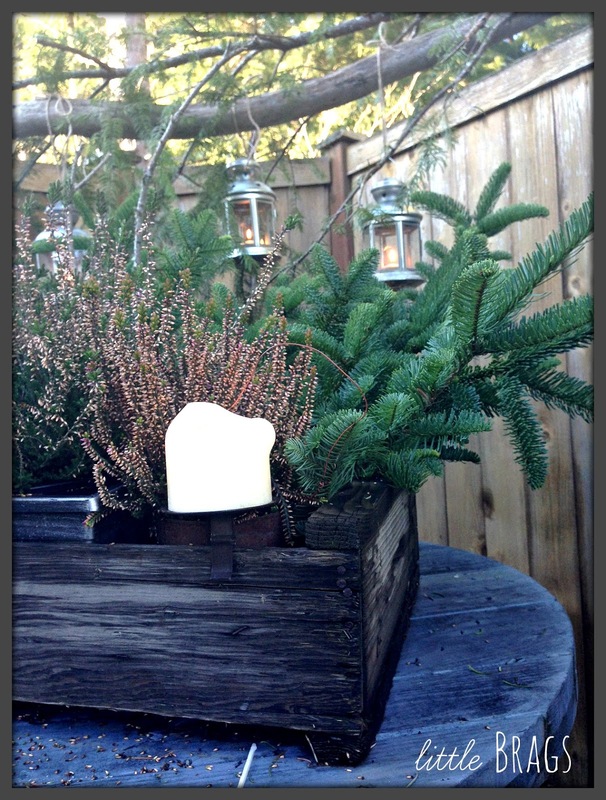 I would love to have you post on my blog hop—the Weekend Blog Hop at My Flagstaff Home (www.myflagstaffhome.com). It begins on Thursday evenings and lasts through the weekend, if you're interested. What a great way to stretch that tree into January. I love your little backyard area. You made great use of your tree and the branches make the perfect winter greenery. Hey, Christine! Thanks for bringing this post over to My Flagstaff Home! It looks adorable! It is so cold here during winter that I don't even bother doing anything outdoors. It is so neglected looking! 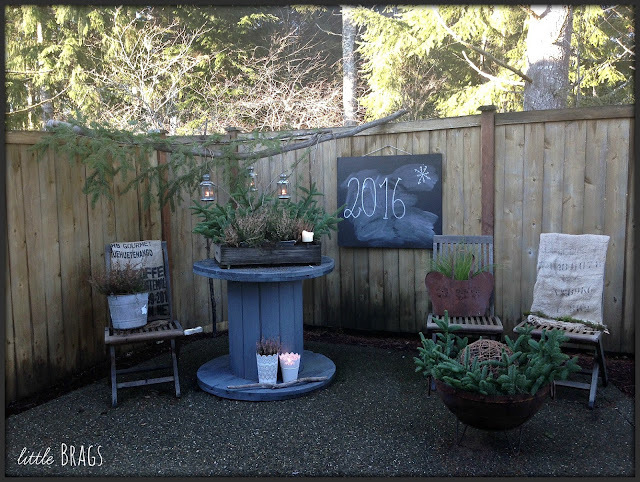 that's a very cute outdoor area and you did a great job making it sweet for winter! 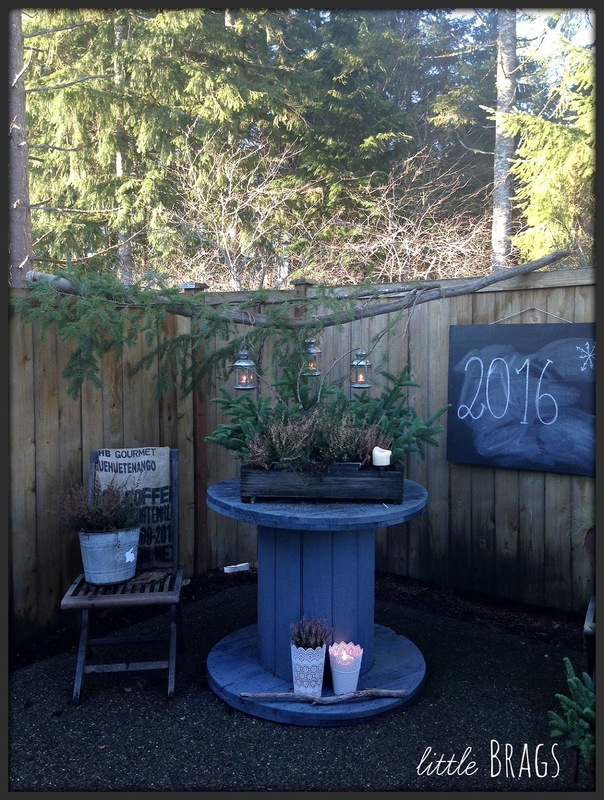 What a cozy and pretty Winter corner in your yard. All the elements of nature chosen are great. I love it! 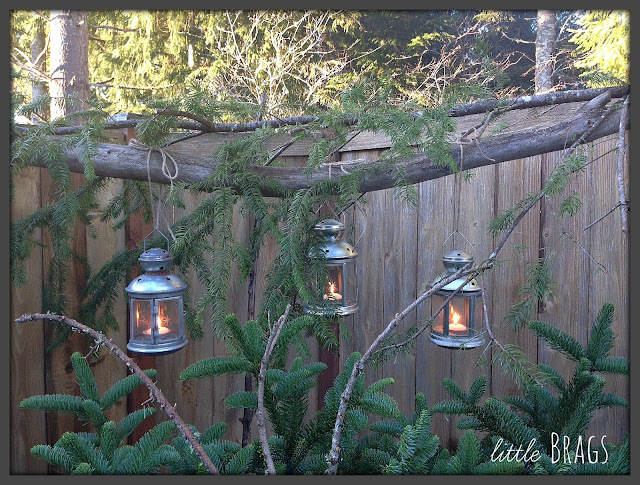 How clever to use a branch across your fence to hang your lanterns! A very cozy winter corner! I'm glad you commented on my post so that I could find your blog! Love it! I don't know if I have ever seen a more beautiful outdoor space! Liebe Christine, einfach nur wunderschön und so bezaubernd! Es freut mich wirklich sehr, dass mal ein Beitrag aus der USA dabei ist. Vielen Dank für deine Teilnahme, es freut mich, dass du zum ersten Mal dabei bist! ABER: das Besondere am Sunday Inspiration ist, dass der Bllogpost aus nur EINEM Bild bestehen darf. 1 Bild = 1 Inspiration. Bitte beachte das für zukünftige Beiträge. Und könntest du meinne LinkParty bitte noch auf deinem Blog oder in deinem Blogpost verlinken?